The lung tumors with carinal involvement are frequently managed with tracheal sleeve pneumonectomy and tracheobronchial anastomosis without use of cardiopulmonary bypass (CPB). Various modes of ventilation have been described during tracheal resection and anastomosis. Use of CPB during this period allows the procedure to be conducted in a more controlled way. We performed tracheal sleeve pneumonectomy for adenoid cystic carcinoma of left lung involving carina. The surgery was performed in two stages. In the first stage, left pneumonectomy was performed and in the second stage after 48 h, tracheobronchial resection and anastomosis was performed under CPB. Second stage was delayed to avoid excessive bleeding (due to heparinization) from the extensive vascular raw area left after pneumonectomy. Meticulous peri-operative planning and optimal post-operative care helped in successful management of a complex case, which is associated with high morbidity and mortality. A 27-year-old male weighing 56 kg, presented with history of cough for four years with recent onset of hemoptysis. Patient was hemodynamically stable. On chest examination, air entry was absent in the left lower zone and leftward tracheal shift was present. The respiratory rate was 16/min and room air saturation was 96%. Arterial blood gas analysis on room air showed a pH of 7.39, partial pressure of oxygen and carbon dioxide 83.5 mmHg and 34.7 mmHg, respectively. 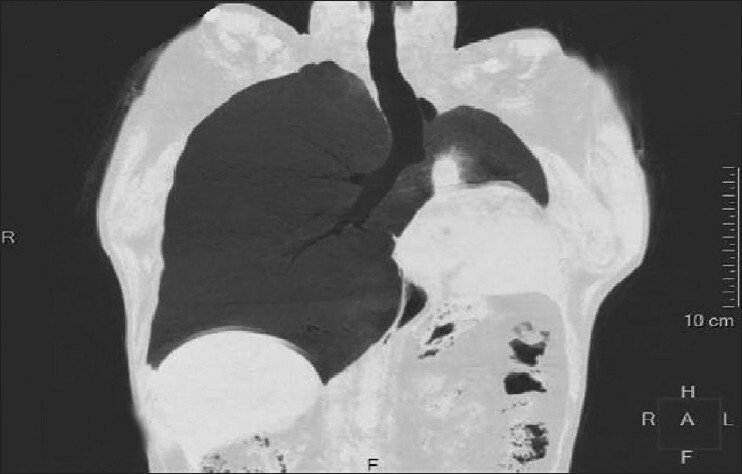 Chest X-ray revealed left lung collapse accompanied by ipsilateral mediastinal shift and hyperinflation of the right lung. Non-contrast computed tomography thorax showed similar findings with obstruction of left bronchus by a growth and showed no evidence of mediastinal lymphadenopathy [Figure 1]. 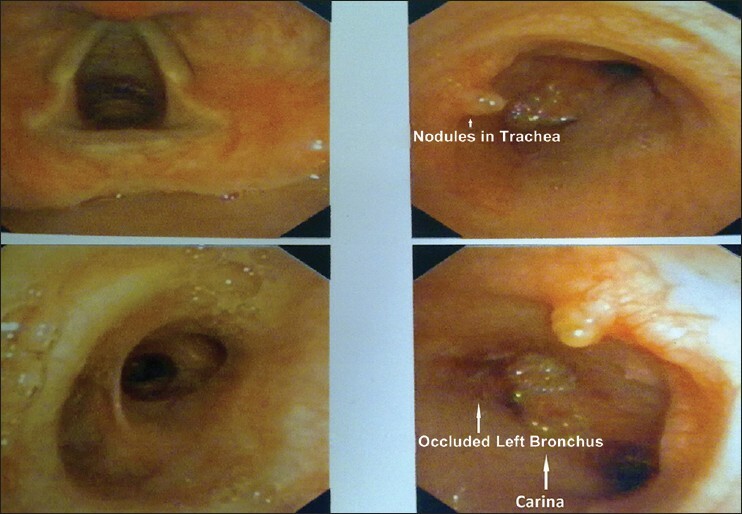 On flexible bronchoscopy, islands of tumor were seen in lower part of trachea and carina completely occluding the left main bronchus [Figure 2]. Biopsy confirmed the growth as ACC. Surgical excision of left lung along with carina and end-to-end anastomosis of right bronchus with trachea was planned. Additional workup was done to assess feasibility for surgery. The hematological profile was unremarkable with hemoglobin of 12.6 g/dL. Forced expiratory volume in 1 s was 2.25 L. Cardiac functions were normal as per cardiovascular examination, electrocardiography and transthoracic echocardiography (TTE). Pulmonary artery systolic pressure was 28 mmHg as estimated by adding right ventricular systolic pressure and central venous pressure during TTE. Oral midazolam 7.5 mg was given 30 min prior to surgery. In the operating room, peripheral venous access was secured with 16 G venous cannula followed by insertion of thoracic epidural catheter at T2-3 interspace. Radial artery was cannulated under local anesthesia. Anesthesia was induced with 5% sevoflurane, and intravenous (IV) fentanyl 100 μg and midazolam 1 mg. Rocuronium 50 mg was administered to facilitate tracheal intubation with a conventional 8.0 mm cuffed ET tube under direct laryngoscopy. We deliberately avoided using both left as well as right sided double lumen endobronchial tube (DLT) as the left main bronchus was completely occluded by the tumor and the right sided DLT was considered to compromise right upper lobe ventilation, if malpositioned. Patient was ventilated with low tidal volumes (6 ml/kg) and a respiratory rate of 15/min in view of presence of single functional lung. Central venous access was secured in right internal jugular vein. Depth of anesthesia was guided by bispectral index (BIS) monitoring with a BIS target of 40-60 and achieved with 0.5-1.0 minimal alveolar concentration sevoflurane, 25-50 μg/kg/min propofol and 0.02-0.03 μg/kg/min fentanyl. Rocuronium boluses 10 mg were administered intermittently to ensure paralysis. Fibreoptic bronchoscopy before surgery confirmed previous findings. Initially, left pneumonectomy was performed through the left thoracotomy. 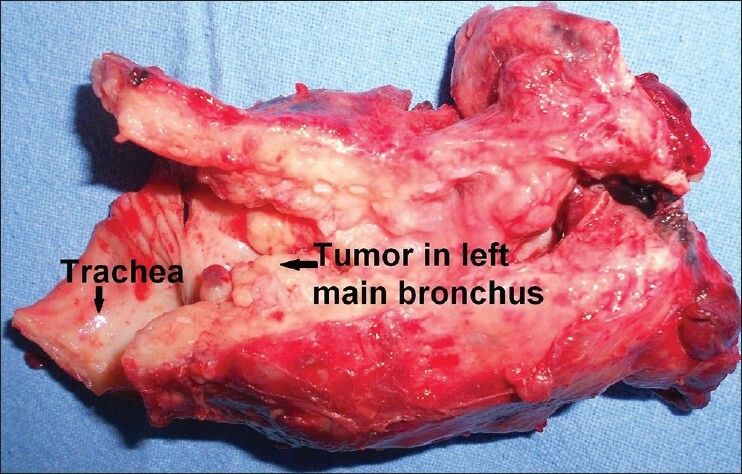 During pneumonectomy, the left main bronchus near its origin from trachea was clamped to protect the soiling of the healthy lung from debris containing tumor tissue. There were widespread adhesions of the left lung with the chest wall, which resulted in extensive raw area after pneumonectomy. At this stage, we considered CPB unsafe for TSP as full heparinization for CPB could lead to excessive bleeding. Therefore, to avoid complications associated with heparinization in presence of extensive raw area, we decided to complete TSP in second stage after 48 h. After first stage of surgery, fast track extubation was done within 1 h. Post-operative pain was managed with epidural infusion of 0.125% bupivacaine and 2 μg/ml fentanyl. Baseline infusion rate was set at 0.1 ml/kg/h and rate was modified according to severity of pain. Total chest drain in 48 h after pneumonectomy was 480 ml. Total two units of packed red blood cells were transfused. After 48 h, second stage of surgery, i.e., tracheobronchial resection and tracheo-right bronchial end-to-end anastomosis was performed. Adequate blood products were arranged in advance. After induction of anesthesia, patient was intubated with cuffed ET tube and ventilated with tidal volumes of 5-6 ml/kg and a respiratory rate of 15-20/min to avoid barotrauma to the only functional lung. Tranexamic acid, 1 g, was given slowly prophylactically to prevent excessive bleeding. The chest drain tube was clamped before surgery. After midline sternotomy, hilum of right lung was mobilized and mild hypothermic CPB was established using aortic and right atrial cannulation. The ET tube was pulled up high in the trachea under direct bronchoscopy until the ET tube cuff was positioned just below the vocal cords. The high-tracheal position of ET tube ensures adequate length of trachea for the operating surgeon; however, precaution was taken to ensure adequate length of the ET tube below the vocal cords to prevent accidental extubation. 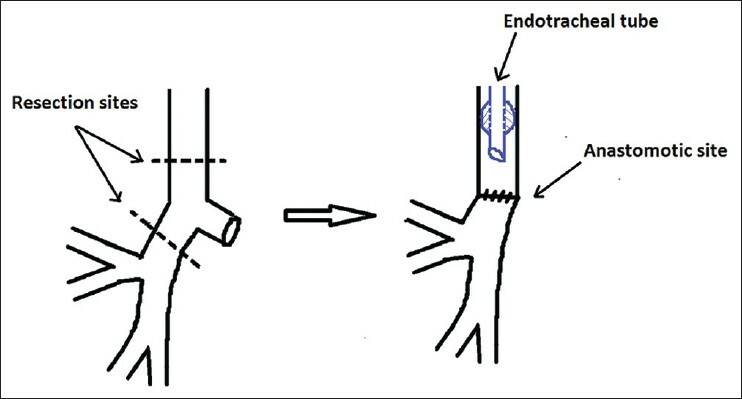 Bronchoscopy guided resection of carina 1 cm above the tumor (1 cm tumor free margin) and stump of left main bronchus was done [Figure 3]; it was followed by end-to-end anastomosis of right bronchus with trachea. Bronchoscopy helped to monitor level of resection of tumor. After anastomosis, hydropneumatic leak test was performed and after ensuring no anastomotic leak, thorough endobronchial lavage was done with normal saline to remove blood and debris until returning fluid from trachea and distal airway was clear. Thereafter, the distal end of ET tube was positioned proximal to the anastomosis under direct vision. Distal end of ET was not placed distal to the anastomosis so as to avoid impinging of anastomosis by the ET tube cuff. Prior to weaning from CPB, few slow sustained breaths to a peak pressure of 25-30 mmHg were given to expand collapsed lung segments and a positive end expiratory pressure of 5 mmHg was applied to prevent any decrease in functional residual capacity post-CPB. Two chin stitches were applied to keep neck in flexed position in post-operative period to prevent anastomotic dehiscence. The check bronchoscopy with flexed neck revealed mid-tracheal position of the ET [Figure 4]. Post-operatively, patient remained stable and extubated after overnight ventilation; bronchoscopy guided nasal intubation was planned in case of any emergency. Post-operative analgesia was managed with epidural infusion of 0.125% bupivacaine and 2 μg/ml fentanyl with baseline infusion rate of 0.1 ml/kg/h, which was adjusted according to severity of pain. Epidural catheter was removed 48 h after second surgery. Chest physiotherapy, breathing exercises and incentive spirometry were given to prevent atelectasis and to aid in functional recovery of remaining lung. No special maneuvers were needed as the patient showed good efforts on incentive spirometry and performed breathing exercises very well. Neck was maintained in flexed position for 1 week. Later the patient was not able to phonate though he could cough out secretions. Flexible laryngoscopy revealed left vocal cord palsy. Rest of his post-operative stay was uneventful and he was discharged from the intensive care unit (ICU) after 2 days of second stage of surgery. Partial recovery of the left vocal cord function occurred 4 months after surgery. TSP is performed for lung tumors involving carina. These tumors are classified T4 (Stage IIIb) and the benefit of surgery in these patients remains questionable. However, some authors have reported satisfactory results in terms of survival with acceptable morbidity and mortality. ,, Bagheri et al., reported 3-year survival in 88.8% patients after surgical resection in a series of nine patients and considered it the best method of treatment for ACC of trachea. Left TSP is rarely performed due to complexity of the surgery and higher rate of complications. ,, The indications for left TSP are limited to young patients with a low degree of malignancy. In our patient, there was no evidence of nodal metastasis; therefore, a long-term survival is expected. TSP can be performed in either one stage or two stages, both having advantages and disadvantages; with one stage surgery, a shorter ICU stay is claimed. In the present patient, because of extensive raw area after pneumonectomy, we expected significant blood loss and considering complications of excessive transfusions, we decided to stage the surgical procedure; however, the changed strategy did not lead to increased ICU stay. Ventilation strategy is based on extent of airway involvement. Femoro-femoral bypass is instituted or kept ready before induction if a difficult airway is anticipated or acute hemodynamic compromise is suspected during induction. Difficult airway can be expected if tumor is obstructing tracheal lumen which may result in failure to ventilate and acute hemodynamic compromise may result if tumor is compressing great vessels. In our patient, femoro-femoral bypass was not required as the airway difficulty was not expected and vascular compression was not present. During tracheal resection and anastomosis, the lung is commonly ventilated with a cross-field sterile ET tube using low tidal volume controlled ventilation or HFJV. ,, Use of intermittent apneic ventilation by passing the ET tube intermittently through open airway has also been reported. , This technique requires repeated insertion and withdrawal of ET tube which increase the duration of the procedure, diverts the attention of the surgeon and make the procedure technically complicated. Whereas the use of ET tube obscure the surgical view and make placement of sutures difficult, which may affect the quality of anastomosis. HFJV can lead to barotrauma and impaired ventilation resulting in hypoxia or hypercapnia. , Moreover, a high rate of acute respiratory distress syndrome has also been reported with use of HFJV. Considering, these pertinent issues we decided to complete sleeve resection and anastomosis in the second stage under CPB. To summarize, the reduction in operative mortality and morbidity in these complex surgeries can be directly attributed to careful pre-operative assessment, optimal anesthetic and post-operative management as well as advances in surgical techniques. Use of CPB allows completion of surgical anastomosis in a controlled manner and minimizes chances of traction on sutures, which can otherwise lead to anastomotic dehiscence, the most dreaded complication of the procedure. 1. Porhanov VA, Poliakov IS, Selvaschuk AP, Grechishkin AI, Sitnik SD, Nikolaev IF, et al. Indications and results of sleeve carinal resection. Eur J Cardiothorac Surg 2002;22:685-94. 2. Regnard JF, Perrotin C, Giovannetti R, Schussler O, Petino A, Spaggiari L, et al. Resection for tumors with carinal involvement: Technical aspects, results, and prognostic factors. Ann Thorac Surg 2005;80:1841-6. 3. Macchiarini P, Altmayer M, Go T, Walles T, Schulze K, Wildfang I, et al. Technical innovations of carinal resection for nonsmall-cell lung cancer. Ann Thorac Surg 2006;82:1989-97. 4. DeWitt RC, Hallman CH. Use of cardiopulmonary bypass for tracheal resection: A case report. Tex Heart Inst J 2004;31:188-90. 5. Watanabe Y, Murakami S, Iwa T, Murakami S. The clinical value of high-frequency jet ventilation in major airway reconstructive surgery. Scand J Thorac Cardiovasc Surg 1988;22:227-33. 6. Roviaro G, Varoli F, Romanelli A, Vergani C, Maciocco M. Complications of tracheal sleeve pneumonectomy: Personal experience and overview of the literature. J Thorac Cardiovasc Surg 2001;121:234-40. 7. Mitchell JD, Mathisen DJ, Wright CD, Wain JC, Donahue DM, Allan JS, et al. Resection for bronchogenic carcinoma involving the carina: Long-term results and effect of nodal status on outcome. J Thorac Cardiovasc Surg 2001;121:465-71. 8. de Perrot M, Fadel E, Mercier O, Mussot S, Chapelier A, Dartevelle P. Long-term results after carinal resection for carcinoma: Does the benefit warrant the risk? J Thorac Cardiovasc Surg 2006;131:81-9. 9. Bagheri R, Masum SH, Majdi NM, Rahim MB. Adenoid cystic carcinoma of the trachea. Tanaffos 2008;7:49-54. 10. Ginsberg RJ. Carinal resection and sleeve pneumonectomy using a transsternal approach. Oper Tech Thorac Cardiovasc Surg 1998;3:203-16. 11. Clevenger FW, Acosta JA, Osler TM, Demarest GB, Fry DE. Barotrauma associated with high-frequency jet ventilation for hypoxic salvage. Arch Surg 1990;125:1542-5. 12. http://www.ctsnet.org/sections/clinicalresources/thoracic/expert_tech-50. [Last published on 2012 Oct 14; Last cited on 2013 Oct 09]. 13. McCarthy JF, Hurley JP, Neligan MC, Wood AE. Surgical relief of tracheobronchial obstruction in infants and children. Eur J Cardiothorac Surg 1997;11:1017-22. 14. Woods FM, Neptune WB, Palatchi A. Resection of the carina and main-stem bronchi with the use of extracorporeal circulation. N Engl J Med 1961;264:492-4.